The Ceredigion WPCA’s Foal show was held at the Parc Stud by kind permission of Daniel and John Morgan on the 19th of September at 5.30 in the evening, following the committees decision to change the day from a Saturday to a Friday evening due to various events clashing definitely proved a success, with a great turnout of quality foals forward. The President for the evening was Mr John Green, Steffan Stud a committee member and a great supporter of the Association. His choice of Supreme Champion which was sponsored by Mr Peter Price Fronerthig Stud was Richard and Gethin Morgan’s Bay Section C filly Ormond Ruby’s Delight with the grey Section A filly Dargale Vanity Fair the property of D and G Jeffries, taking the reserve Supreme Champion which was sponsored by Mr Geraint Jones of the Nebo Stud. 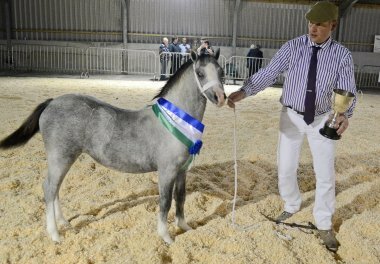 The evening’s rosettes sponsor was the show’s vice President Mr Roger James. 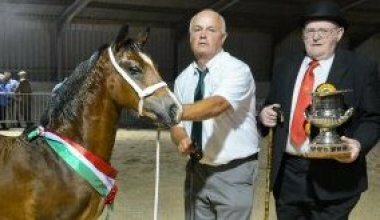 The Committee express their gratitude to all those who contributed in any way towards the evening especially all the exhibitors who turned their foals out to the highest of standard.